Fujifilm's GFX 50S is a high-end medium format mirrorless digital camera that features a 51.4mp sensor, Fujifilm's latest X-Processor Pro and a new GF lens mount, a tilting LCD display and a 1280x960 OLED viewfinder. On the top of the camera there is an E Ink display that shows the camera settings and status in highly readable way. 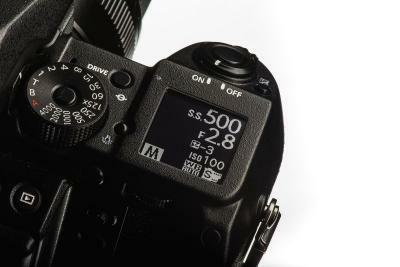 The GXF-50S is now shipping for $6,499 (body only). Digitimes reports that E Ink Holdings is ramping up its electronic shelf label display (ESL) production as the company expects double-digit growth in 2017. EIH recently began to ship smart label displays to Alibaba Group and JD.com subsidiaries. E Ink shipped around 30-40 million ELSs in 2016, which is 50% of the total ESL market. Digitimes says that the company hopes to become an ESL supplier to Walmart and Amazon.